Natural Gas-Fired Microgrids: How Do They Compare? Why Use Natural Gas in Microgrids? 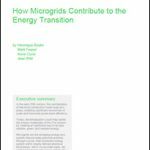 We explore the advantages of natural gas-fired microgrids in part four of a six-part Microgrid Knowledge Special Report Series on the affordable microgrid. Microgrids can use a variety of generation sources: natural gas, diesel, flywheels, fuel cells, energy storage, solar panels and even wind turbines. Here we look at what natural gas offers in a microgrid that other fuels may not. Because of its widespread availability, diesel has been the traditional solution for engine reliability, whether for backup generators or as part of a resiliency microgrid. But even this workhorse fuel has its limits related to operating cost, availability and environmental impact. In particular, during Hurricane Harvey the diesel supply chain was extremely challenged. Many of the nation’s largest refineries closed, leading to widespread gasoline and diesel shortages across Texas. Even when diesel was available for purchase, extreme flooding, debris and downed trees and power lines often prevented delivery trucks from reaching sites that had run out of their supply. Furthermore, when fuel delivery is possible after a major weather event, National Guard units have the right to commandeer fuel trucks destined for commercial and industrial customers. By the same token, a solar-plus-storage microgrid does not solve the problem. Cloud cover severely limited solar production for five days as Hurricane Harvey battered the Houston area. From a resiliency standpoint, solar panels, even those backed by load-shifting batteries, were not able to perform as first the sun failed and then the batteries. “A resiliency microgrid has to have an infinite fuel source behind it, otherwise that resiliency is really not there,” said Thomas McAndrew, president and CEO of Enchanted Rock (ERock). This points to a key advantage of natural gas-fired microgrids over other energy sources during hurricanes, as natural gas is transported by underground pipelines that remain unaffected by severe weather. While diesel is still the number one microgrid fuel source, natural gas is number two and closing. Specifically, 82 percent of installed capacity is driven by fossil fuels; of this, about 60 percent is diesel and 40 percent is natural gas, according to “US Microgrids 2017: Market Drivers, Analysis and Forecast,” published in November 2017 by GTM Research. 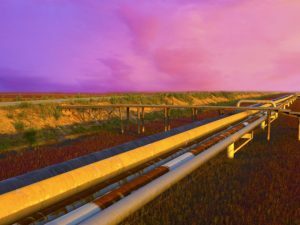 Today, the U.S. natural gas distribution system spans a network of about 3 million miles of pipelines, according to the US Energy Information Administration (EIA), including about 1.5 million miles of low pressure, local distribution pipelines. Most of those pipelines are underground, which puts them out of harm’s way from extreme weather events. Natural gas also enjoys an inherently more resilient distribution network of about half a million producing wells in 30 states, and unlike electricity, can be stored on a large scale. It also moves slowly enough to be re-routed to bypass problems and potential disruptions, even through high pressure pipelines. Fewer than 100,000 natural gas customers experienced disruptions in 2016, while 8.1 million Americans experienced power outages, according to the EIA. During the hurricanes that submerged Houston and swept up the East Coast in 2017, virtually no gas outages were reported. In fact, a plentiful supply of natural gas met existing contracts and filled spot market needs, according to the Natural Gas Supply Association. While many customers relying on overhead power lines suffered outages, natural gas demonstrated its reliability and versatility. Hydraulic fracturing has caused natural gas prices to drop 47 percent compared with what the price would have been prior to the drilling revolution in 2013, according to a Brookings Institute report. The supply of natural gas has also expanded rapidly in the past decade thanks to new sources made available from tight shale formations. Using hydraulic fracturing to reach into these formations made the US the world’s top producer of natural gas and oil in 2016 for the fifth straight year, according to the EIA. That flood of gas has also lowered prices. Hydraulic fracturing has resulted in natural gas prices to dropping 47 percent compared with what the price would have been prior to the drilling revolution in 2013, according to a Brookings Institute report. As a result, natural gas consumers have seen their bills drop $13 billion annually from 2007 to 2013. According to EIA projections, natural gas prices will remain relatively flat, about $5 per million British thermal unit (MMBTU) from 2030 to 2040. Current prices are around $3/MMBTU. As an alternative to diesel fuel, natural gas also delivers an environmental bonus in the form of lower nitrogen oxides (NOx) emissions. ERock’s gas generators permit for <<0.14 lb/MWh NOx emissions, with an emission rate of less than one percent of a standard Tier 2 diesel generator and less than four percent of a standard Tier 4 diesel generator. ERock calculates that they have avoided 13,651 lbs of NOx emissions under the assumption that a typical Tier 2 diesel generator would have emitted 13,686 lbs of NOx over the same period. Assuming degradation, in less than a year ERock’s natural gas microgrids have emitted 34.65 lbs of NOx during reliability runs. All in all, natural gas-fired microgrids can provide a continuous supply of power with lower emissions and at competitive prices. Gas-fired engines are also among the most efficient forms of generation available. And, with the right design, they can be sited within a relatively small footprint and meet local air quality and noise requirements. Equally important, natural gas-fired microgrids are flexible assets that can be deployed quickly on the grid, unlike solar power or a CHP plants. This allows for the integration of renewables to the grid, as quick-start capacity can balance the grid when renewables are intermittent. As a result, the microgrid can provide various wholesale market services that support renewable energy, as we’ll explain in the next chapter of the series. Reliability-as-a-Service: What is an Affordable Microgrid? 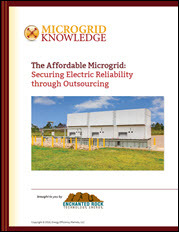 We welcome you to download this special report, “The Affordable Microgrid: Securing Electric Reliability through Outsourcing,” free of charge, courtesy of Enchanted Rock, and to widely distribute the link. What is the Value of Electric Reliability for Your Operation?